Took a little unintentional hiatus from Lust List posts but they’re back! I’m actually not the biggest fan of blues. I’ve mentioned it before but navy just doesn’t do it for me * GASP * You might be wondering how I worked at Ralph Lauren for so long (hehe). BUT I do love this shade of light blue and fell in love with this sweater in the city this weekend. I also picked up this floral dress which I’m shooting tomorrow…so excited! Pssst! Let me let you on on a little secret. Click here for this dress and then click here for the same dress. Notice anything different? The price! Whenever I’m shopping European brands I always check Matches first. They offer a better price and have free shipping and returns. Also, taxes are minimal if at all. You’re welcome! Posted on March 25, 2019 by Stephanie Trotta and filed under Lust List. 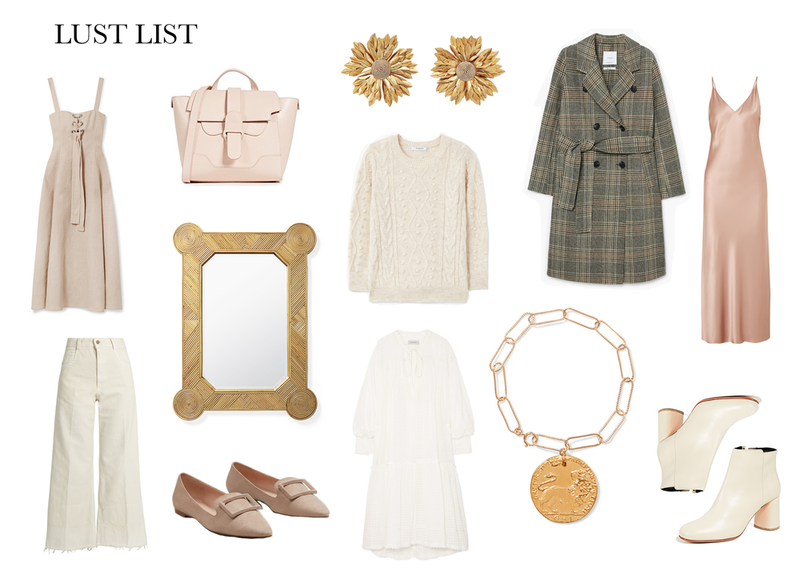 Its been a little while since my last Lust List and I wanted to think transitional neutrals heading into Spring. I really love this color palette because it works well with every skin tone, hair color, and its almost season-less. This fringe skirt is so pretty. Love it paired with a tucked in white tee and a denim jacket. This dress - sold out last year when I wore it in this post and its back in stock! Posted on March 4, 2019 by Stephanie Trotta and filed under Lust List and tagged safari style bodysuit net-a-porter loewe. Posted on February 19, 2019 by Stephanie Trotta and filed under Lust List. 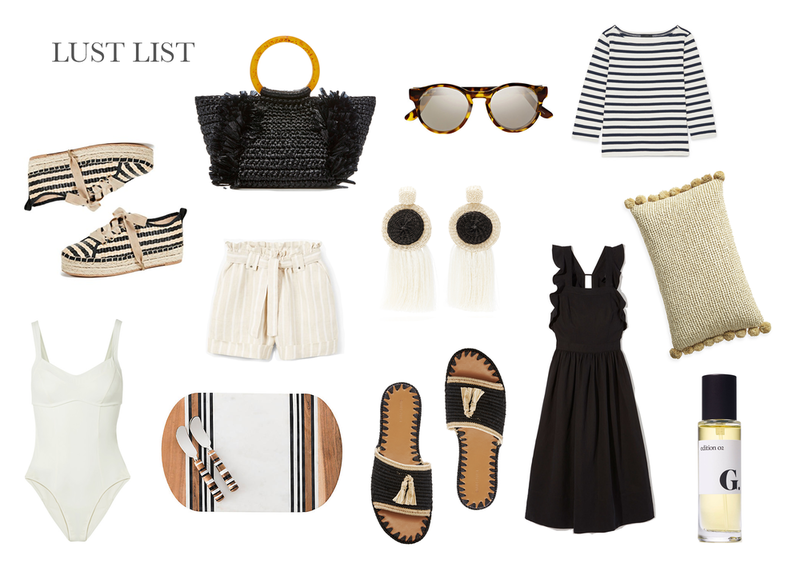 Its never to early to shop for the beach:) This is always one of my favorite lust lists to do because they’re so happy! I’ve been curled up on the couch in sweats and slippers planning a dream getaway in my ultimate wardrobe. While shopping this week I discovered (yes, taking full credit for this one) a new brand. I absolutely love the style, it reminds me of Loveshackfancy, and I was surprised by the prices. Not inexpensive but definitely competitive given the aesthetic. I love this skirt with a white tee and the olive gladiator sandals. Also, these were the cult favorite shorts last summer. I have a feeling they’re going to be again and I’m thinking over ordering them. They’re high-waisted and this seems to be the perfect go with everything wash. Stay tuned! Posted on January 15, 2019 by Stephanie Trotta and filed under Lust List. I could have made this gift guide over 100 items!!! Love shopping for BOY presents:) This gift guide is a combination of Luke’s favorite things and some items on our wishlist for the boys this year. This sweeping/cleaning set has resulted in hours of self-play and recently Harry has loved this pushing this shopping cart around. This is one of my go-to sites for finding interesting toys and home items for kids and babies. They also have great parenting articles. If you’re looking for the perfect gift for boys (and girls) and actually adults love these too…click here. You can NEVER have enough! Posted on November 18, 2018 by Stephanie Trotta and filed under Boy Mom, Lust List and tagged holiday gifts for boys the tot baby oeuf state backpacks melissa and Doug toys bicycle for toddler bicycle with training wheels banwood balance bike guitar for kids crosley helmet for toddler and kids boy mom boy gifts gift guide. Posted on September 6, 2018 by Stephanie Trotta and filed under Lust List and tagged mango sweater CB2 GOOP CB2 bowl with bird blush colored skirt chloe drawstring bag tortoise earrings krewe sunglasses. I want EVERYTHING! I created a Fall shopping list for a client and had to share. She wanted neutral blush tones, a mixture of textures, and a asked for a trench that would go with everything. Et voila! I get so many questions about the rug in our living room. It's been sold out but found one more site with it. BEST neutral color and looks and feels very expensive! Posted on August 14, 2018 by Stephanie Trotta and filed under Lust List and tagged pom pom mango sweater gold coin bracelet ivory boots rachel comey high waisted jeans plaid trench coat. Posted on August 4, 2018 by Stephanie Trotta and filed under Lust List, Outfits. By not you're probably over all the #NSALE posts and shopping for sweaters and coats when its 95 degrees out seems silly! 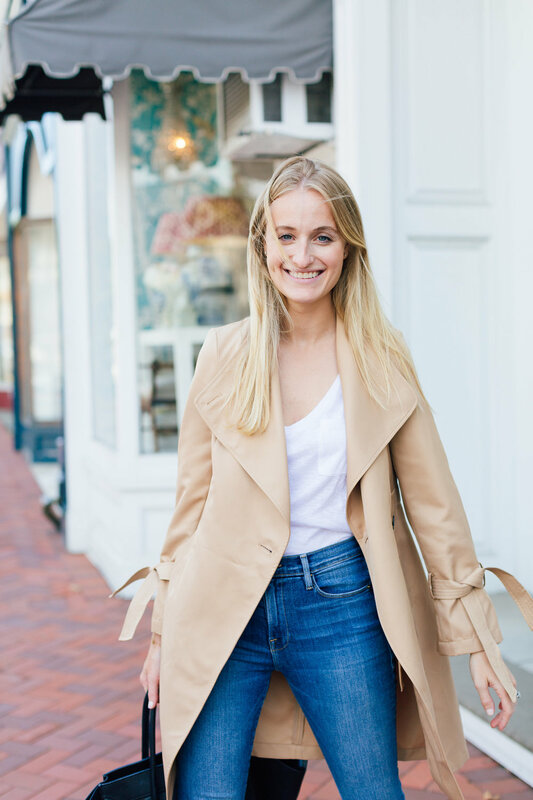 I will say you'll thank your summer self in September when you want to buy the perfect distressed jean to wear with a new sweater and everything is full price! This post began with a cardigan. It comes in 4 colors (love all of them) but I was really attracted to this minty gray blue. Its a color I've been seeing a lot for Fall and surprisingly looks great paired back to plaids and florals. I've ordered from this site before and its 80% great, 20% ehhh. I will say they represent their items well and the quality is usually one step above Zara. Hope you like this edit! Posted on July 19, 2018 by Stephanie Trotta and filed under Lust List. I recently had a client reach out because because she loved this under $100 post. We had already added a handful of splurge items to her closet for summer but she still had the "itch" to shop. She asked me to round up a few more steal pieces et voilà! Clearly I still had my sister's bachelorette weekend on my mind when I added in the cocktail napkins. Ordered number one and five and LOVE number 12! Another item that didn't make the list but I love is this striped neutral blazer. Perfect for now and Fall! Posted on July 6, 2018 by Stephanie Trotta and filed under Lust List. So if the 4th of July is next Wednesday do we celebrate this weekend or next technically? I'm confused! I love the shade of blue in this week's lust list. Not sure if I've admitted this before to you but I'm not a navy girl. People always tell me to wear it and that its a great color for blondes but for some reason its at the bottom of my list. But this paler blue I can get behind! I'm headed to the Hamptons this weekend for my sister's bachelorette party. SO excited (and so happy we're not going to Vegas LOL). I hope everyone has a great weekend! It looks like its going to be a hot one on the East Coast. Posted on June 29, 2018 by Stephanie Trotta and filed under Lust List. Happy first day of summer! Currently sitting outside while Luke plays with slime and Harry naps. After 10+ years in corporate America I'm feeling very grateful for my new found flexibility and work/life balance! Weekend plans you ask? Nothing! We may head up to the farm on Sunday but definitely looking forward to keeping things casual. I love this week's lust list because it represents my high/low style. You don't have to break the bank everything in your closet! Can you guess which piece is under $30? This dress is another under $100 favorite! Posted on June 22, 2018 by Stephanie Trotta and filed under Lust List. Hump day! This week's lust list reminds me so much of the "original" ones. They used to be more themed by color and lately they've become a little more of a weekly cravings roundup. This blue was inspired by my friends recent trip to the South of France. If you don't follow her already you'll have to check out her blog design darling. Here is the link to the palm tree print! So sweet for a boys room or bathroom. Posted on June 7, 2018 by Stephanie Trotta and filed under Lust List and tagged blue cote d'azur summer style one kings lane raffia nail. And we're back! I posted a very tired picture of myself on my stories last night and someone responded saying, "Long weekends are not vacations for moms". SO TRUE! I'm wiped today and so happy to get back to our regularly scheduled programming:) I hope everyone had a happy and healthy weekend. We were so happy we cancelled our trip to Florida as it looks like their weather was much worse than ours! Hope everyone enjoys the rest of this short week! Posted on May 29, 2018 by Stephanie Trotta and filed under Lust List and tagged wedding pictures the bowery hotel belle fleur tibi luggage suitcase hostess gift rattan zimmermann bikini. HAPPY FRIDAY!!! Its raining in CT and its nap time which means I'm getting lots of work done! 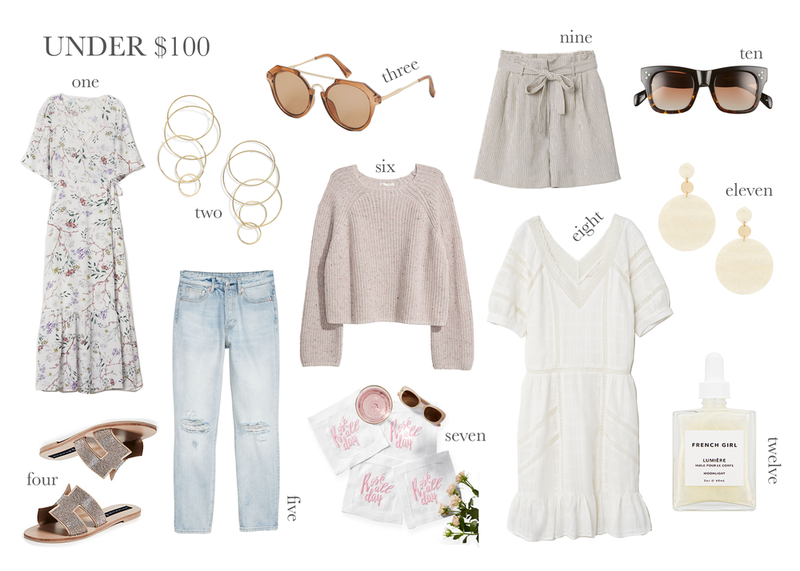 I was due for an under 100 post and loved making this one because there are so many pretty (and well priced) things out there right now. This dressy t-shirt is so elegant! I recently ordered this robe! Love the weight of it for the spring/summer. Look out for an update on it in my Instagram stories! Posted on April 27, 2018 by Stephanie Trotta and filed under Lust List and tagged UNDER 100. Clearly you can see I have vacation on my mind! I purchased this necklace a couple of weeks ago and knew I wanted to incorporate it into one of my lust lists. You can't tell from the pic but its actually oversized and I immediately thought it looked like an Hermes necklace (and certainly something more expensive). I'm not usually a green person but loved these pale tones paired back to blushes and ivory. If I do wear green its always a shade of "army" which is a closet staple! Posted on April 19, 2018 by Stephanie Trotta and filed under Lust List and tagged what to pack vacation cult gaia aerin tory burch bikini rachel zoe mango. Seriously I can't believe its Thursday already! Where did this week go?! 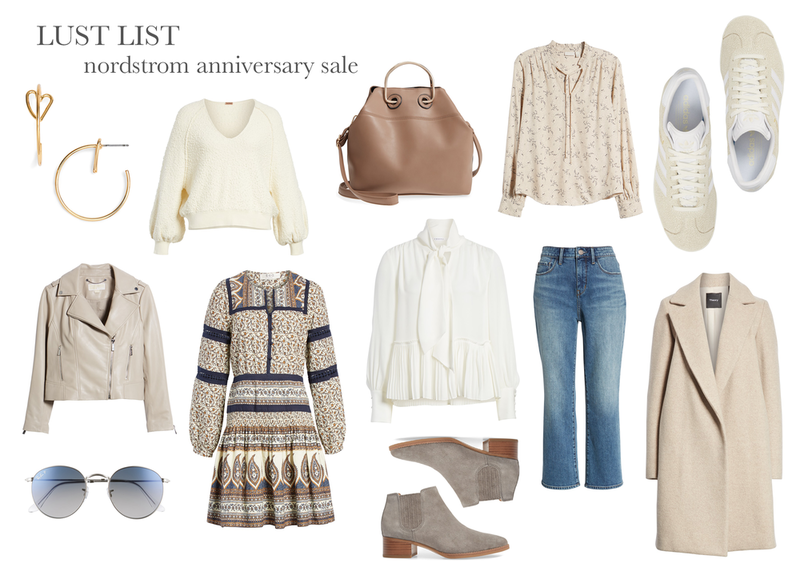 There are so many great pieces in the shopbop sale right now that I decided to use it for this week's Lust List! I added these to my order last night...needing to update last year's run-around summer sneaker and they were under $100 on sale. Did you know that even if your first purchase only qualifies you for 20% off but you make another one during the sale they will adjust all your purchases to 25% off? This happened to me during their Black Friday sale and I was so happy with the customer service! Posted on April 12, 2018 by Stephanie Trotta and filed under Lust List. Posted on April 5, 2018 by Stephanie Trotta and filed under Lust List. Three years and two babies later I'm finally ready to head back into the gym. When I was pregnant with Luke I pictured myself 8 weeks post-partum - jogging around the park pushing a Bob stroller with one hand and an iced tea in the other. A girl can dream!! Well that never happened and now I'm a little embarrassed to admit how long its been since I really exercised. Hence the inspiration for this under $100 roundup. Slight disclaimer today: these sneaks and this pair of wireless headphones are under $150 but I wanted to include them because they were a recent purchase (gifting myself for Mother's Day) and I LOVE them both! Is my gym journey something you would like me to share? PS tagged my favorite 100% natural deodorant above! 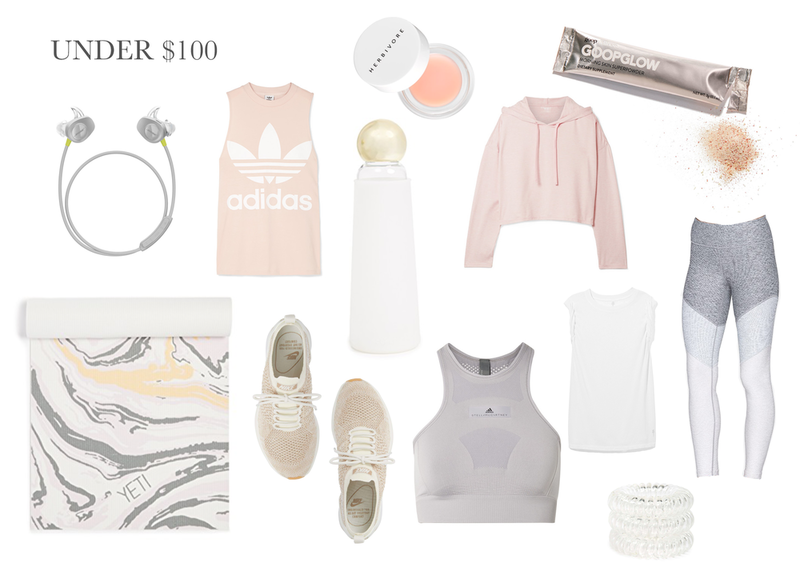 Posted on March 20, 2018 by Stephanie Trotta and filed under Lust List and tagged workout adidas nike goop goop glow outdoor voices stella mccartney yeti yoga head phones water bottle shopbop herbivore. SNOW DAY and I'm sitting here imagining myself walking down a warm Charleston street in this pretty dress, straw bag in hand filled with flowers! LOL one can dream! This dress almost made it into this week's lust list but it just didn't fit! A great price point though for this style and quality. I also found this style for under $100 IF you can go without a bra (I wish!). AND these white sneaks are so cute for spring/summer and also under $100. Love the jute sole! Posted on March 7, 2018 by Stephanie Trotta and filed under Lust List and tagged spring style cuyana muun chic wish goop earring illesteva sunglasses summer style wicker jute bootie sandals white dress.